MOSCOW, July 19. /TASS/. Russia’s Strategic Missile Force is preparing a position area for accepting the Avangard hypersonic missile system for service as part of the efforts to strengthen the country’s military security, the Defense Ministry announced on Thursday. "The Russian defense industry has completed developing the Avangard missile system with the principally new armament - the gliding cruise warhead. Industrial enterprises have switched to its serial production," the Defense Ministry said. "A set of organizational and technical measures is underway in the position area of the Dombarovsky large unit of the Strategic Missile Force to accept the Avangard missile system for operation," it added. The development of new strategic weapon systems "is aimed at increasing Russia’s defense capability and preventing any aggression against our country and its allies," the Defense Ministry stressed. "The position area has been prepared in geodesic and engineering terms to accommodate the missile system. Work is underway to build new and reconstruct old facilities to provide for the operation and the combat use of the system. Technical and utility supply lines are being modernized and electric power, communications and command and control cables are being laid. 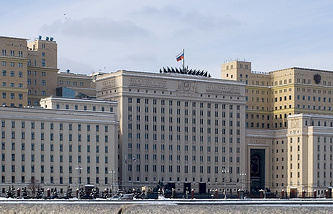 Work has been arranged to train personnel and prepare armament, military and special hardware," Russia’s Defense Ministry said. Deputy Commander of Russia’s Strategic Missile Force for Armament Sergei Poroskun has said that the Avangard hypersonic missile system features combat capabilities that "make it possible to reliably breach any anti-missile defenses." The Avangard hypersonic glide vehicle flies at an altitude of several dozen kilometers in the dense layers of the atmosphere. It travels over an intercontinental distance at a hypersonic speed of over Mach 20. "As it travels towards its target, the glide vehicle is capable of performing controlled maneuvers both laterally (over a distance of several thousand kilometers) and by its altitude, which makes its flight unpredictable for anti-missile defenses and enables it to dodge the areas of operation of their information and weapon systems," the ministry said. Besides, the boost-glide vehicle flies along the trajectory below the minimal altitude for interception by anti-missile defense capabilities. The intercept by short-range killer missiles is also unlikely, the Defense Ministry said.